The Living Dungeon is a fast paced tactical dungeon romp which will offer a totally unique multiplayer experience for groups of friends and families alike. It has flashy animation and shiny normal mapped graphics, still, it’s the gameplay that will keep you coming back again and again. Head on over to The Living Dungeon website for more info. BOOMBA! is what would happen if you gene spliced a game like Worms with a game like Angry Birds. It’s very different from either and just as fun as both. Take your team of cute little characters and try to obliterate the opposing team and their tower. Jump around. Choose from a dozen weapons including the rat rocket and the rocket propelled Chainsaw. BOOMBA! is out now on iOS, Android, Windows Phone 8, Windows 8, and soon Nintendo 3DS. Newton Vs The Horde is a strange game. It’s a physics defense game and we have found that many people love it and other people hate it. Either way we can guarantee you haven’t played anything like it. No one tells you how to beat any level, you can do it any way you like from launching monsters into space right through to dropping a filing cabinet on their heads. Just make sure those monsters don’t get to the scientists. Bullet Trap is a lightning paced shooter where every bullet you fire could end up killing you or your team mate. Shots bounce off the walls and you can only move between a few fixed spots. It’s just as well you have a reflective shield. Do you like cars, guns, and roofs. Well why not combine all three in what could be the best retro shooting driving game never made. 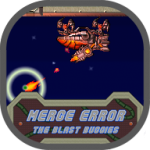 Blast buggies combines retro pixel art with fancy visual effects from the modern era. Drive on the walls and ceilings. Jump from surface to surface and blast a horde of enemy units. Blast Buggies is fully playable. We just haven’t got round to finishing it and don’t have a good excuse as to why either. We just recently put it on green light and it’s getting a positive response so we’ll see how it goes there and then maybe do something with it other than just play it ourselves for fun.